In Suzhou, a large Chinese city near Shanghai, six practitioners of Falun Gong were unlawfully arrested and detained by police at a postal office as they tried to process legal complaints headed for the nation’s top judicial bodies in Beijing. Falun Gong is a traditional Chinese spiritual practice that, by order of former leader Jiang Zemin, has been persecuted by the Chinese Communist Party since 1999. Tens of thousands are suspected of having been killed by the authorities for their faith, according to investigative research by human rights organizations. Ever since a legal reform passed on May 1, simplifying the conditions needed for ordinary Chinese citizens to file criminal complaints, over 160,000 Falun Gong practitioners have called upon the Chinese judiciary to prosecute Jiang. 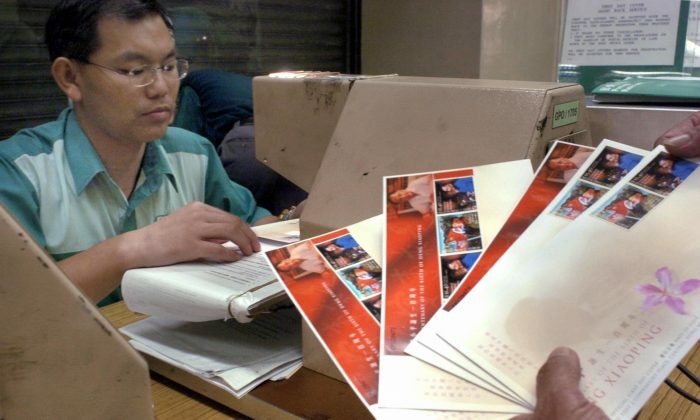 The six practitioners from Suzhou had submitted their criminal complaints to a postal worker on July 4, with the expectation that they would be delivered to Beijing within the next few days, according to a report by Minghui.org, an official Falun Gong website that documents the persecution. But two days later, the mail was still in Suzhou. On July 7, police officers went to the home of Fang Fengzhen, one of the practitioners, but failed to find her. Hearing no word about the status of their files by July 9, the six practitioners went to the post office to enquire. The onsite manager claimed that because of superior orders, complaints against Jiang Zemin were not to be processed and that the mail had been turned over to the police. During the conversation, the postal manager had a staff member call the police. Over a dozen officers arrived and arrested the practitioners, who were taken to a police station and interrogated for hours. Three of the practitioners were kept overnight and their homes were searched and items confiscated without legal process. Falun Gong practitioners have been arrested before when trying to file lawsuits against Jiang Zemin. Typically, arrests are made according to the policies of a prior political era, when the persecution of Falun Gong was a major political task. Even though it is not a goal of the current leadership, the policy of targeting Falun Gong has not been rescinded. The arrests reflect the unfolding contradiction between rule of law and the Communist Party-sanctioned persecution of Falun Gong; as such, local security officials around China often don’t know how to react to Falun Gong practitioners attempting to use the legal system to prosecute the former Party head. In some cases, they have directed citizens to go ahead with lodging their complaints. In other cases, as in Suzhou recently, the police and 610 officials get involved. The 610 Office, a Party agency set up by Jiang to crush Falun Gong, was given authority to operate outside the law. Local police and government bodies were directed by the 610 Office to persecute Falun Gong at all levels of society. In the Suzhou incident, Zhou Wenqiu, head of the local 610 Office branch, threatened female practitioner Fang Fengzeng and mocked her faith in Falun Gong. According to Minghui, she was kept in a cage in the basement of the police station while being interrogated.